Water scarcity is one of the top threats facing our planet, according to the World Economic Forum. The United Nations estimates the crisis afflicts more than 40 percent of the global population and will only worsen in the coming decades. Today – March 22 – is World Water Day. In honor of it, we are bringing you the reasons that precipitate water scarcity and what the EARTH community is doing to reverse course. The World Bank reports that 70 percent of all water extracted across the globe is used for agriculture. Addressing the water crisis is thus critical for the present and future of farming. Surging population growth and climate change only exacerbate the threat, ensuring more food must be grown and in harsher conditions. This adds stress to the world’s rural areas and necessitates farming that is more measured in its water use. The water crisis’s disastrous implications for the agricultural sector have driven EARTH University to confront the issue and spread the word of its encroachment. 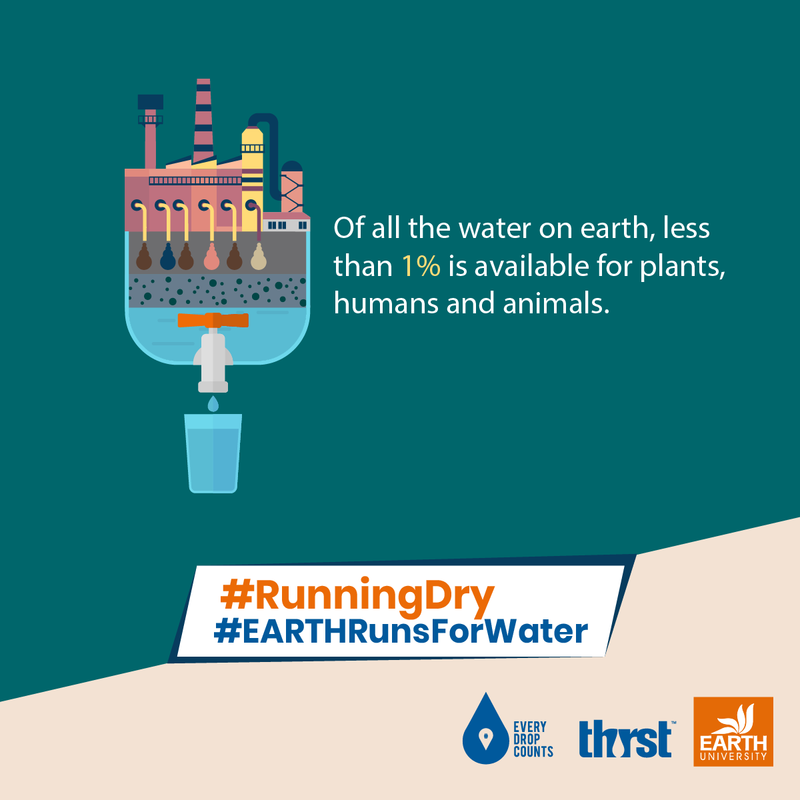 We teamed up with Thirst to host a #RunningDry athletic marathon that would boost awareness of proper water stewardship. In the process, we joined forces with the thousands of people from around the world who have run for the cause. EARTH’s marathon – carried out at our Guácimo and La Flor campuses in Costa Rica and our Foundation office in Atlanta, Georgia, USA – centered on consciousness raising around the necessity of water in farming. EARTH University’s multicultural student body and faculty meant more than 30 countries were represented among the runners. Our participants shared statistics about the water crisis on social networking sites before and after running – circulating our impassioned message to tens of thousands of people from across the globe and in dozens of languages. In addition to our students, faculty and staff, we were supported by several influential Costa Ricans – such as international journalist Glenda Umaña as well as accomplished distance runners Gabriela Traña and Daniel Johanning. The University operates an experimental fertigation station, where students and faculty carry out nutrient-dosage research for crops fed by a drip system. This method maximizes productivity and minimizes the use of resources such as water and fertilizers. Similarly, as part of EARTH’s impact model, students design Graduation Projects in which they develop innovative solutions for rural areas to more easily and effectively practice sustainable agriculture. Currently, Devotha Tumushimiyimana and Hilarie Uwamahoro (’19, Rwanda) are working to invent a low-cost, high-efficiency water-filtration system for Rwandan farmers who irrigate cropland via the Nyabarongo River. In their Graduation Project, Gloria Uwizeyimana and Grace Umutesi (’19, Rwanda) have proposed water-conservation best practices – both technical and social – for higher-functioning rural communities. By calculating the carbon footprint of various irrigation methods, Andrey Vargas Campos (’19, Costa Rica) endeavors to identify climate change mitigation and adaptation tactics for sugarcane production. He then will recommend the top water-saving options for the cultivation of that crop – first-of-its-kind research in Latin America. These leaders, with their diverse approaches to sustainability, demonstrate the University’s commitment to our shared planet’s water resource. Their efforts, along with those of our alumni like Christian Golcher (’08, Costa Rica), will continue contributing to sustainable development through careful management of water in agriculture and beyond.